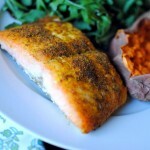 Since salmon seems to be on our weekly dinner menu, I am always looking for new ways to prepare the flavorful fish. 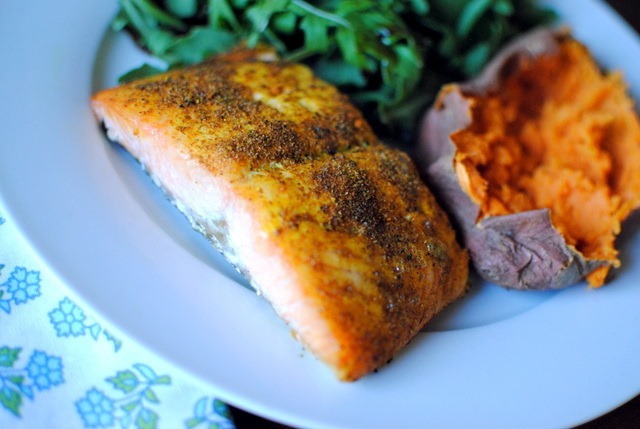 Last night, I grabbed some of my favorite spices that I typically reserve for chicken or vegetable dishes and tried them out on a fresh salmon filet. I discovered garam masala last year and ever since then I cannot seem to get enough of the spice. (If you’re looking for a crock pot friendly recipe featuring garam masala, check out this recipe: Crock Pot Garam Masala Chicken and Chickpeas) I use McCormick’s garam masala (I buy it at Publix) and love the aromatic combination of flavors from coriander, cumin, cinnamon, cardamom and black pepper. With garam masala serving as the base for the spice mix I made last night, I added garlic power, turmeric, salt and pepper before sprinkling the spices on top of the fresh salmon filet. The end result was fabulous. Ryan and I both had wonderful things to say about this dish! I use McCormick’s garam masala (I buy it at Publix) and love the aromatic combination of flavors from coriander, cumin, cinnamon, cardamom and black pepper. If you decide to give this recipe a try, I hope you love it as much as we did! Oooh this looks delicious! 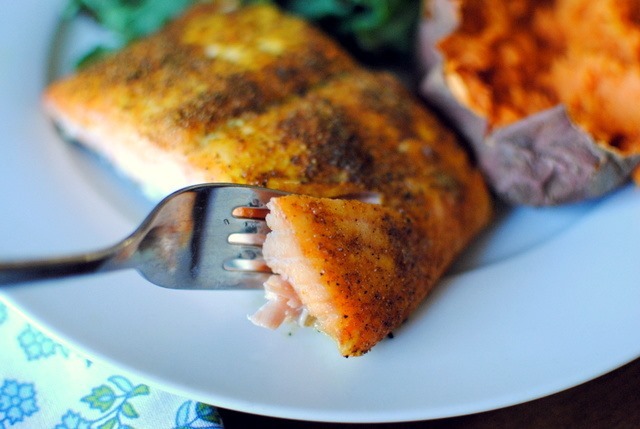 This may be a great easy dinner for tonight once I get off work! needing some ideas! Oh! Great idea! I have a ton of garam masala and am psyched to have a new way to use it. It’s such a delicious flavor, isn’t it? I love garam masala, but I’ve never had it with seafood. I’m not a huge salmon (or any fish) fan, but I try to eat it from time to time because I know it’s good for me. Perhaps this is just the thing to get me to eat a bit more! This looks awesome! 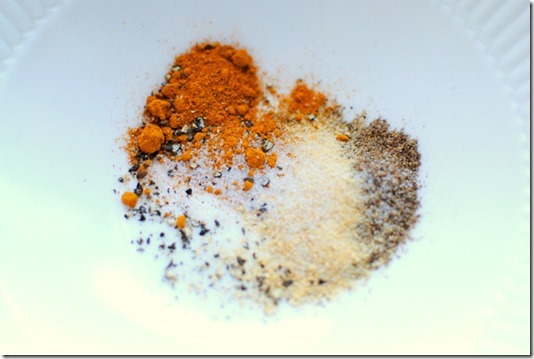 And after your post I would love to give garam masala a try! I love salmon and always looking for new ways to make it. Thanks for sharing! This looks delicious. Salmon is top of my list of first fish to reintroduce again! Teriyaki salmon sounds incredibly appealing! I’m trying this. I usually stick to pepper and lemon juice (so boring). This looks like somethin’ out of a restaurant, lol. Not kidding! Yum. Yay, I’ve missed your recipes! Putting the spice on the fish sounds like a great idea! I love fish and am always looking for new spice combos to jazz it up! I’ll have to give this a try! A personal fave of mine is curry, chili powder and garlic powder. I’m not sure how it would taste on salmon, but it’s great for white fish. Indian spices and salmon 🙂 The best combo! I’m always looking for ways to mix up my salmon recipe. I just love a honey glazed salmon so much that I never try anything else. i am totally gonna try this next week. i was on a salmon kick for a while, using my steamer tray, but it got old. this looks delish! Crazy I had actually seasoned my tofu with these exact blend tonight! Garam masala is just so tasty. Gonna have to try it on salmon now. Oh and I’ll have to try it on tofu!! Mmm I’ve never thought to put garam masala on fish! Fabulous idea! I love salmon with some big punches of flavor 🙂 Thanks for sharing the recipe! Yum! I’m always looking for ways to dress salmon up. Seems like every time I make it I’m like, oh look. Salt and pepper, how fun. I haven’t tried garam masala yet but it’s on my spice wish list. I have been loving Turmeric lately, the health benefits of this one little spice are incredible! I wish I could get my hands on some fresh fish, but living in the middle of the country leaves limited options and fish that will break the bank if you do buy it! I need a trip to florida just for some fresh seafood! Forget the salmon. Bring on the wedding pictures!!! I have been loving salmon lately, and this looks amazing! Looks delicious and super flavorful!!!!! I’m always looking for new salmon recipes! I really wish I liked Salmon because you make it look so good in the picture! I have never heard of this seasoning/spice! What does it taste like (I know that’s a tough question)? Garam Masala. My First time to encounter it. But the delicious-looking salmon filet, that was sprinkled with a spice mix using Garam masala as base …..is convincing enough for me. Will get me a pack of those and see how it goes with my cooking. The first pic of the brown baked salmon bought water in my mouth . 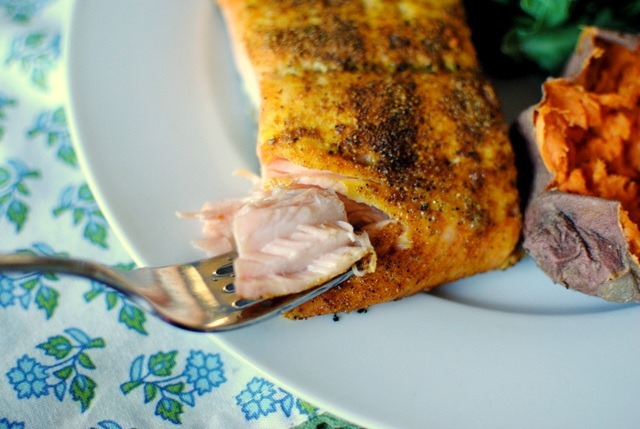 Salmon + Garam Masala – is surely a wonderful combo. Garam masala is predominantly an Indian spice mix which adds brilliant colour and flavor to any kind of recipe. Can I add a pinch of Saffron to it? This recipe is simply wonderful! 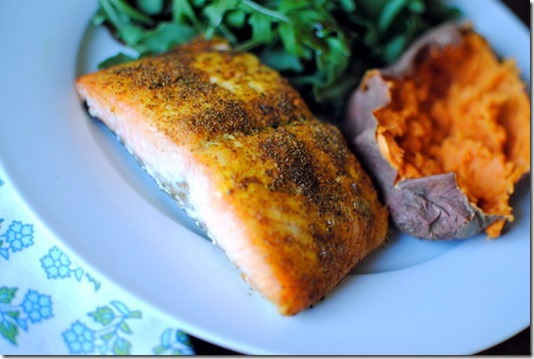 Salmon is such an amazing, healthy food and to prepare it this way makes it simply perfect! I just can’t wait to try it! Thank you for sharing! I mostly do the cooking at home and now I have a worthy surprise for my wife this weekend. She loves Salmon and this recipe should be a nice surprise. Thank In advance! I love Salmon. Its contains a healthy amount of fats too. Definitely going to try this for dinner. I’ll probably combine it with some seasoned garlic and pepper potatoes too.